Samsung isn’t done adding all of the Android Pie features to the Galaxy S9 and Galaxy Note 9 One UI beta it seems. 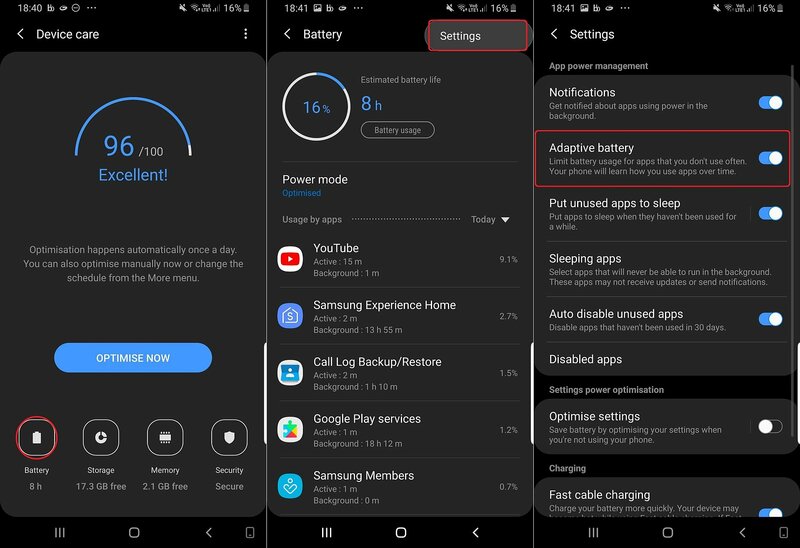 The latest beta update for the Galaxy S9 (and most likely the next Note 9 beta) comes with one of Android Pie’s highlight features: Adaptive Battery. Adaptive Battery is an AI-based feature that learns how you use various apps on your phone over time and uses that data to improve battery life. Adaptive Battery works by learning your usage patterns for various apps. It allows the apps you use regularly to stay in memory after you exit them. Apps you use rarely are killed as soon as you exit them so that they don’t run in the background and waste battery life or use Wi-Fi or mobile data. And, for example, if you tend to regularly use the Twitter app for 10 minutes every morning after waking up at 7 AM and then use it again only at 1PM in the afternoon, Adaptive Battery can stop the app in the background in those few hours and wake it back up at 1PM. Of course, Galaxy smartphones have already had similar battery-saving measures. For example, apps that are not used for a particular number of days can be put to sleep automatically until the next time you open them. However, Adaptive Battery is important because it’s built into core Android. It also uses artificial intelligence to learn usage patterns instead of going by the number of days an app has been left unused. Just how much of a difference it will make is something we can’t say at the moment, though, as Adaptive Battery needs a few days to start doing its job. If you’re running the Android Pie beta, here’s how you can find Adaptive Battery. Open the Settings app, tap Device Care, then tap the Battery icon. Here, tap the three-dot button on the top right of the screen and then the settings option. You will find the Adaptive Battery toggle here, along with many of the other battery-saving features. For more on Samsung’s One UI and the Android Pie update’s features and changes, check out our ongoing One UI (Android Pie) feature focus series of articles. Is there Any chance to Get New software update in A8+ 2018 in India? or( I am thinking of throwing my phone in garbage) Shoud I throw away my phone? No updates and No any performance or camera improvement from a long time. The phone has not been updated since July. Check the lists of updates. I’m sure your phone works fine so throwing it in the garbage doesn’t seem like a sensible option. You could always sell it. 😉 If you go to androidsouldotcom you can find the full list of updates, even the December security patch has been released. I can’t put the link here but it’s easy to find. Well, yes, Samsung seems to have forgotten them. A8+ was on quarterly schedule since day one anyway while the A8 was on monthly, probably because the latter sold more in Europe where rules and regulations are tougher and people can drag you to court for the lack of updates (and not always win, but it’s still a problem if someone drags them to court I guess). But the A8+ isn’t getting stuff quarterly, either, and you can expect similarly poor update support on other A series phones. Betas are not meant to be widely available. I have an unlocked Exynos Note9, I don’t have the beta either. Even in countries where it is available, just a small number of people are on beta. This is to avoid widespread problems for everyone if a bad bug comes along. It’s the only sensible approach. Be patient, you’ll have the finished version in January. Still waiting for the beta to become available for the carrier models if they are in consideration.